Born in N.Ireland in 1986, David graduated in Three Dimensional Design at Northumbria University in 2007. He completed a fellowship on the Designers in Residence Programme at Northumbria’s School of Design in 2010... Read more and subsequently went on to establish his own Industrial design Studio in 2011. As a practice David Irwin works for leading manufacturers operating predominately within the spectrum of contemporary furniture, product and lighting design. The studio's design focus is rooted in material exploration and driven by a desire to assign purpose to both traditional and contemporary manufacturing processes. The goal is to create objects which enhance our daily lives through the utility that they provide and the character they possess. 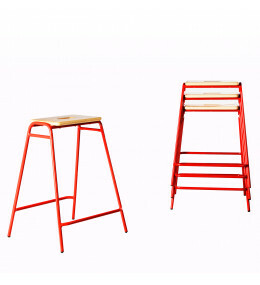 Working Girl are contemporary stacking high, medium and low stools in a range of frame colours.